Some people work best in solitude and some like conversations, interactions and exchange of ideas. Either way, Goa now has co-working spaces that let you indulge in your dream of living in Goa and ensuring that you don’t just go susegad, and actually make some moolah to pay for that Goan life. Check out these cafes and co-working spaces that are perfect for you. The Old Quarter is a lovely hostel located in the charming Fontainhas area of Panjim. This hostel has a café that also is a great co-working space, simply called The Urban Café. It has good wi-fi, coffee, tea and other light refreshments, and a nice ambiance that is perfect to get your creative juices flowing. Colabr in Panjim again aims to build a community of future tech enthusiasts, designers & entrepreneurs. Spread across 1,200 sq. feet, it offers desk spaces, conference rooms, access to the pantry, air-conditioning, wi-fi and an AV room. Here, you can take a day pass for INR 300, so you don’t necessarily need to be a member to use avail the services. Mozaic Co Working Space at the Design Valley definitely shows off all its great design elements. It is formed by Mozaic and friends of Design Valley and is located in Alto-Porvorim. As a design centre that is also a co-working space, it only means that you will get to meet a lot of creative people here to exchange ideas and possibilities. They have group spaces, small offices, meeting rooms, an amphitheater, cafeteria, exhibition space and more. Creativity and functionality seamlessly integrate here. They do not offer day passes, though, but you take a trial for a day if you looking at exploring a membership with them. Session Haus in Candolim is a lovely outdoor garden café. It has a very relaxed and chilled out vibe, but with really fast Internet and a great menu comprising fresh juices, salads, burgers and more. They can offer meeting rooms on demand, and have a hostel nearby if you are looking for a place to stay and need to work a few hours whilst you are there. They even conduct regular meet-ups, so it is also a great place to meet other tech geeks. 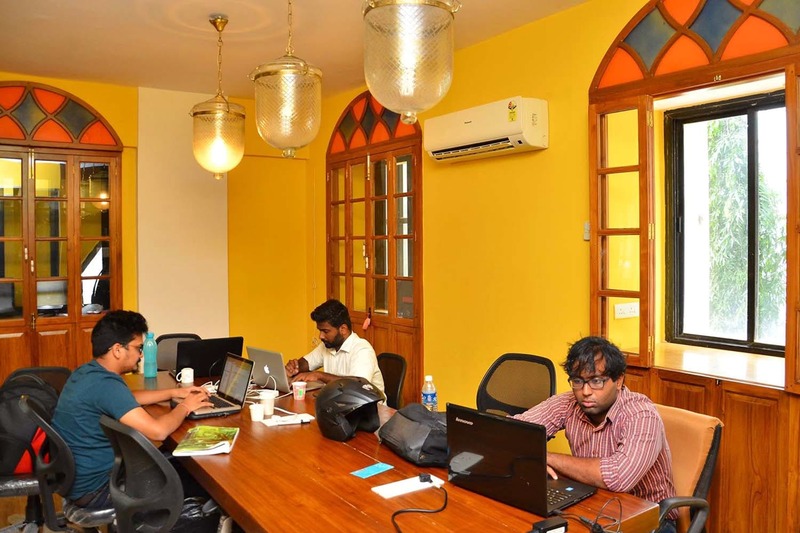 91Springboard is a multi-city co working company that set up it’s Goa outpost last year. Located in Panjim, they offer the usual refreshments, wi-fi, conference room, and more. Interestingly, they also do a lot of workshops and events at their space, which is what has made them hugely popular. They offer a lot of different plans and packages, so whether you are working solo or in a small team, this is good co-working set-up worth checking out.